 Erikson (Sociology/Yale) expands his earlier examination of communities under stress (Everything in Its Path, 1977) in an attempt to define a new kind of trauma that those victimized by man-made disasters now face. According to Erikson, what happens after a disaster such as a dam break or an oil spill is often at least as traumatic as the primary event itself. He highlights the plight of the Grassy Knoll Indians in Ontario, who faced both relocation by the Canadian government and the discovery that mercury was contaminating their river; the mercury poisoned their bodies, and being uprooted from their ancestral lands shattered their culture. Erickson examines a Ft. Collins, Colorado, suburb threatened by an underground gas leak caused by a Royal Petroleum service station; he then revisits the nuclear disaster at Three-Mile Island and the potential consequences of a proposed nuclear waste-disposal site in California's Yucca Mountains. Among other cases he discusses are the homeless, the victims of Hiroshima, and the subject of his original book, the victims of the Buffalo Creek Flood. 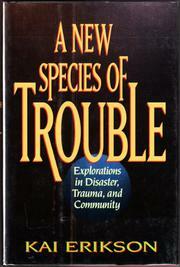 In all these instances, Erikson is heading toward a distinction between natural and unnatural disasters, arguing that while natural disasters (e.g., earthquakes and hurricanes) can sometimes build a sense of community, unnatural disasters usually destroy it along with any collective feeling of trust and security. These points have been previously made by sociologists Michael Edelstein and Phil Brown. Unfortunately, Erikson, who often testifies in litigation cases involving trauma, leaves the reader frustrated and ultimately dissatisfied by his failure to bring up to date his report and conclusions on the communities examined.